I started backpacking in 1995 when I moved to Washington State. Since then, I have backpacked in all seasons and conditions. I prefer trips on rugged trails with plenty of elevation gain. While I continuously strive to lighten my load, comfort and safety are most important to me. I have finally managed to get my basic cold weather pack weight, not including consumables, to under 30 lbs (14 kg). 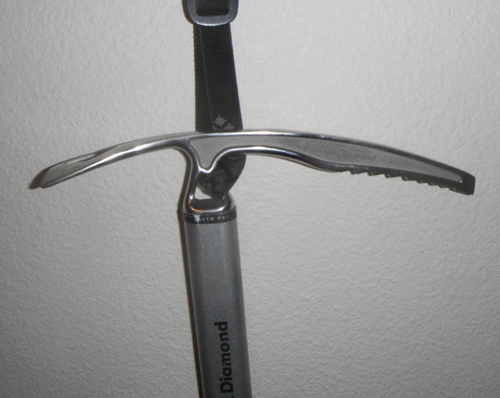 This is a basic mountaineering ice axe for alpine climbing on low to moderate angle terrain (vs. a technical tool for climbing steep/vertical ice) with a CEN-B rating (vs. a CEN-T for technical tools). It consists of a lightweight aluminum shaft with a stainless steel spike on one end and a “investment-cast” one piece stainless steel head on the other. The axe has a straight shaft that is light gray with the Black Diamond name and logo. The spike has a cutout in the center to save weight and creates an attachment point. The adze side of the head also contains a cutout, diamond shaped, partly for decoration and partly to save weight. The head has a second cutout just above where the head connects to the shaft; this is the primary connection point, for anchoring and/or a leash. In reviewing the current version of this axe the only change in the design I can see is that it looks like they have added another cut out in the head just above the leash cutout. The pick has an aggressive sawtooth cut in to its underside and a very sharp edge to the point. The adze also has a very sharp edge (not quite knife sharp, more like a hatchet but ground only on one side, the bottom). I purchased the 70 cm size (28 in). Note: Ice axes are normally listed in metric units as a nod to their European origin. 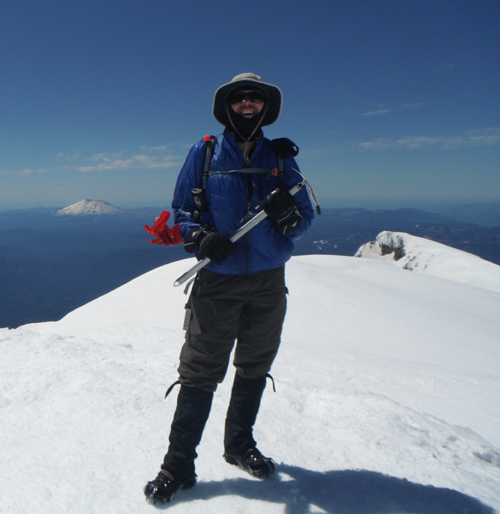 The Black Diamond Raven Pro was my first ice axe, I purchased it in preparation for climbing Mt Shasta (Northern California), and prior to this I had no experience with using an ice axe. Along with the axe I purchased a leash, but since this is an accessory I will not go into detail about that other than to say it is a good match for the ice axe and installs easily and securely. Aside for one trip this summer this has been my one and only axe for my alpine trips. On this last trip I loaned my Raven to a first time climber (it made sense to give her the lighter and shorter axe) and in its place used a very old axe I picked up because it was so cheap (longer and weighs more than twice as much). I only mention this as it is my main reference for comparing the comfort, weight, and length of the Raven. One of the things I like best about the Raven is how comfortable it is in my hand. Since I don’t do technical climbing, the majority of the time I am using the axe as an aid in walking with the axe head in my hand. The head and neck (where the head attaches to the shaft) are narrow enough to comfortably fit in my hand and all of the edges are rounded and smooth making it comfortable even when wearing only thin liner gloves. Note: I don’t think I have ever used this without wearing at least a pair of thin liner gloves. My other axe has a much wider head/neck and does not have the rounded edges and I found it could get uncomfortable when using/carrying it for extended periods even with gloves. I have used the axe as a belay anchor when stopping on steep terrain by plunging the shaft into the snow, along with the leash, it has worked quite well for this being easy to insert and remove. On one trip up Mt Adams the conditions were rather poor with high winds and the surface was mostly hard ice. 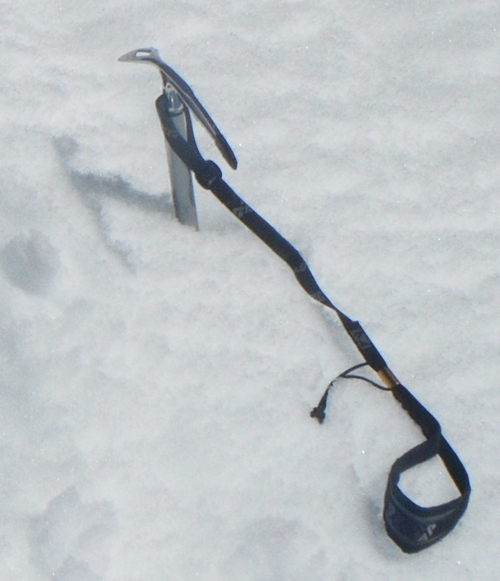 On this trip I was unable to plunge the shaft into the snow/ice to create an anchor so used the pick. The pick penetrated the ice quite well and held firmly. On a few occasions I have used the adz head to carve seats and/or platforms into steep slopes to provide a stable spot for myself and others to rest. The small adz head is not very efficient for moving snow/ice but it very effective at carving and/or chipping away the ice. In camp I have also used the adz head to chop out chunks of ice for melting and it worked very well. Aside from use as walking aid, the second most use I have gotten out of this axe is for glissading where I use it with the spike of the handle in the snow for braking, and when necessary for self-arrest. In addition to practice and teaching others, I have had to use the axe for self-arrest a few times when getting out of control during a glissade and/or when other sliders have unexpectedly stopped in the way. These have occurred in various conditions from soft snow to crusted snow to hard ice and in every case the axe has performed flawlessly (if it had not I might not be here to write this). I should note that the axe can get a real workout when I am glissading. I have been known to get a bit wild and have even managed to melt the pocket of my pack during one high-speed glissade in icy conditions. One additional use I have gotten out of the tool is as an improvised hatchet. I have used the adze to chop off small (pencil to finger thick) branches for use as kindling. My only regret about this axe is its length. Since getting some experience I believe a longer shaft would have been a better choice for me. As I mentioned, this was my first axe and while I had done some research into what I thought I needed, I could find no good consensus on the proper length, so I went with the majority opinion by getting one that when held by the head in my hand extends to about my ankle. I figured I would simply replace it with what I really needed after I broke or wore out this one. Unfortunately, so far from what I can tell I doubt I will “need” to replace this axe in the foreseeable future. Aside for a few nicks and scratches on the shaft (cosmetic only) the axe is showing virtually no signs of wear and no indications as to any part that might fail. So it is looking like if I ever hope to replace this axe, I will need to sell, give away, or lose this one. What can I say about a tool like this? It does exactly what it is intended for, with no extras and no problems. As far as I can tell it is an ideal balance of strength/durability and weight. Made of only 3 parts (head, shaft, and spike) all securely attached with no signs of loosening or wear, all indications are that this could last a lifetime (of course I try not to think about it failing and my life ending could just happen to coincide…). Aside for not getting the longer version I have had no regret in my purchase of this product.